Turkey also has a magnificent past, and is a land full of historic treasures from 13 successive civilizations spanning 10,000 years. Even if you spend only a short time in Turkey, you see a lot of this great past. ( Euphrates ). There are numerous lakes and some as Lake Van, are as large as inland sea. In the north, the mountains along the eastern Black sea coast run parallel to the sea; in the south , the Taurus mountains sweep down almost to the narrow, fertile coast plain. 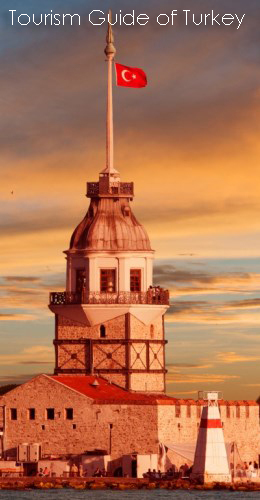 Turkey enjoys a variety of climates, ranging from the temperate climate of the Black sea region, to the continental climate of the interior, then, to the Mediterranean climate of the Aegean and Mediterranean coastal regions. The coastline touching the four seas that border the country is 8333 km in length. Turkey has been called ” the cradle of the civilizations ” and by traveling through this historic land, tourists will discover exactly what is meant by this phrase. The world’s first known settlement, a neolithic city at Catalhoyuk, dates back to 6,500 B.C. From the days of Catalhoyuk up to the present , Turkey boasts a rich culture that through the centuries has made a lasting impression on modern civilization. Being the heir to many centuries of cultures makes Turkey a paradise of information and cultural wealth. Hattis, Hittites, Phrygians, Urartians, Lycians, Ionians, Lydians, Persians, Macedonians, Romans, Byzantines, Seljuks, and Ottomans have all made important contributions to the history of the area. Ancient sites and ruins scattered throughout the country give sufficient proof of each civilization’s unique distinction. Turkey also has a very fascinating recent history. Upon the decline of the Ottoman Empire, a young man named Mustafa Kemal, who was a soldier and a great visionary, took the defeat of World war I and turned into a shining victory by liberating Turkey from all occupying forces. Mustafa Kemal Ataturk founded the Republic of Turkey on October 29,1923. He led his country towards peace and stability that brought about tremendous economic growth and increasing modernization. Through decades of change and growth, Turkey still boasts growing success, living by Ataturk’s motto of “Peace at home, peace in the world”. Turkey’s population is about 70 million, 40 % of whom live in the countryside. The major cities are Istanbul, Ankara ( the capital ), Izmir, Adana, Antalya and Bursa. It is said that three major types of cuisine exist in the world: French, Chinese and Turkish. Fully justifying its reputation, Turkish cuisine is always a pleasant surprise for the visitor. In addition to being the refined product of centuries of experience, Turkish cuisine has a very pure quality. The variety and simplicity of the recipes and the quality of the ingredients are guarantees of delicious meals. The Turkish language belongs to Ural-Altaic group and has an affinity with the Finno-Hungarian languages. Turkish is written in the Latin alphabet and is spoken by least 150 million people around the world. Although Turkey is 99 % Muslim, it is secular state that guarantees complete freedom of worship to non-muslims. Tourism: In recent years, Turkey has become a major tourist destination in Europe. With the rapid development of both summer and winter resorts, more and more people from around the world are able to enjoy the history, culture, and beautiful sites of Turkey year around. From swimming in the Mediterranean to skiing at Mt. Uludag , Turkey has something to offer to every tourist. Agriculture: This plays a major role in the Turkish economy. The main crops are wheat, rice, cotton, tea, tobacco, hazelnuts, and fruit. Sheep are the most important livestock, and Turkey is one of the major cotton and wool producers. copper, bauxite, marble and sulfur. Industry: Industry is developing rapidly and is directed mainly towards the processing of agricultural products, metallurgy, textiles, and the manufacture of automobiles and agricultural machinery. The Republic of Turkey is based on a secular, democratic, pluralistic and parliamentary system, where human rights are protected by law and social justice. The Grand National assembly is elected by popular vote, and the nation is governed by the Council of Ministers headed by the Prime Minister. Turkey is a founding member of OECD, the Black sea Economic Cooperation Organization, a member of NATO, the European Council, the Islamic Conference association, and an associate member of the European Union. Electricity : 220 volts AC, all over Turkey. The voltage is clearly marked on all hotel outlets. Tap Water : Safe to drink in all cities, since it has been chlorinated. Weights and measures : Metric system. Foreign newspapers: Available in large cities and tourist areas. Interpreters – guides : Ministry of Tourism Offices and travel agencies can provide you professional interpreters – guides. Travel agents obliged to provide a guide on all of their tours. Doctors and Dentists : Doctors and dentists can be found in Turkey’s major hospitals and, in addition, there are certain foreign-operated hospitals in Istanbul. The national monetary unit is the Turkish Lira (TL ). The coinage is in 1TL, and 5, 10, 25, 50 Kurus. Bank notes are 5, 10, 20, 50 , 100, 200 TL. The exchange rates for foreign currencies are published daily. Traveler’s checks can be cashed upon producing identification. The most widely accepted credit cards are American Express, Eurocard, Diner’s Club, Visa and Mastercard. Exchange offices in touristic places are generally open until midnight. Thailand, Indonesia, Singapore, Hong Kong, Malaysia, Brunei, Taiwan, Philippines, Korea, Australia, and New Zealand currencies are not convertible in Turkey. Turkish post offices are easily recognizable by their yellow ” PTT ” signs. major post offices are open 08:00 – 24:00 hrs., Monday – Saturday; and 9:00 – 19:00., Sunday. Fax office : It is possible to use this service for sending or receiving documents from other countries. Other PTT services : It is possible to exchange money at some branches of PTT at the currency international exchange rate. International postal orders and traveler’s checks also can be exchanged. An express postal service ( Acele Posta servisi – APS ) operates from Turkey to 72 other countries for letters, documents, and small packages. Stamp collectors will be delighted with the wide range of special stamps available to them. Phone calls : The most economic way to telephone in Turkey is from a PTT telephone booth ( found in all towns ). Telephone cards available. Most Turkish museums are open everyday of the week, except Mondays. Palaces are also closed only on Mondays. The famous Topkapi Palace is closed on Tuesdays instead of Mondays. In order to receive permission for photos or films in museums or at ancient ruins, a fee , which varies according to the entrance fee, is charged. The photographing or filming, for commercial use, of yet unpublished which are copyrighted, requires a special permit from the General Directorate of Antiquities and museums. In Ankara most museums are closed on the first day of religious holidays.